Having a beautiful outdoor space doesn’t have to be complicated or time-consuming, and it doesn’t have to involve excessive water usage. With a turf lawn, you can get the appearance of lush green grass in any residential or commercial outdoor space, without the need for irrigation or maintenance. Forget the artificial turf of the past that looked unnatural. 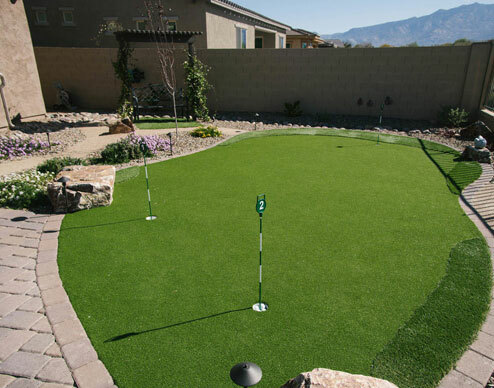 Today’s artificial grass mimics the appearance of a real lawn and is ideal for Tucson’s dry climate. Raised planters offer another way to add appeal and interest to your outdoor space, enhancing the appearance of your turf lawn. Your artificial turf company can install your turf in a few simple steps. Before the installation begins, it is necessary to remove any existing materials on the surface, including soil, weeds, and other debris. Rough grading is performed to ensure a solid base and to protect water lines and other underground pipes. If you have underground sprinklers, they will either need to be capped or relocated. Base preparation. This step involves applying a base layer, usually made of sand and gravel. Your installer will consider factors like slope, rain drainage, and whether or not you have pets when preparing the base. Base compaction. To compact the base, your artificial turf installation company will dampen it and then use a machine to press the base layer down so that it is smooth and stable. If necessary, additional grading can be completed during this step. Artificial turf fitting. Your turf installer will precisely cut and fit the turf to the space. The nails used to secure the turf will be invisible from the surface. Edge tucking. Your turf installation team will tuck the edges of the turf under so that they can’t be seen. Edge tucking will be performed wherever the turf comes to an end, including where it meets landscaping features, such as raised planters. Filling and grooming. Durafill sand or other filler products will be spread around the turf to keep the blades in an upright position. Next, the installer will make any final adjustments to ensure the turf looks as polished as possible. Raised planters are the perfect accompaniment to turf lawns. They allow you to control the growing conditions and keep your favorite plants healthy. Raised planters can be installed in nearly any location in your turf lawn. Within the raised planter, you can add the best soil mixture for the kinds of plants you’re growing. Your installer can add an irrigation system directly to the planter, so you can efficiently water the plants without impacting your turf lawn. Discuss the plants you want to use in your raised planter with your installation company. They will help you choose the appropriate size and placement to keep your plants looking their best. Enjoy the benefits of lush-looking landscaping without the demands of watering and maintenance with artificial turf and raised planters. A New Creation can help you design an inviting outdoor space with realistic-looking artificial grass in Tucson. Find out more by calling us today at (520) 730-3299. For free access to design tips, easy do it yourself projects, and answers to the most commonly asked design questions!